According to the waste analysis conducted by the officials in the Philippines , approximately 64 percent of the intercepted Canadian garbage shipments were “baled municipal solid waste or garbage destined for immediate local disposal and cannot be recycled.” In 2015, wastes from 26 of the 103 containers were illegally disposed of at a private landfill in Tarlac province angering officials and citizens. The situation has been closely monitored by the EcoWaste Coalition, an environmental organization made up of over 140 groups all over the Philippines. 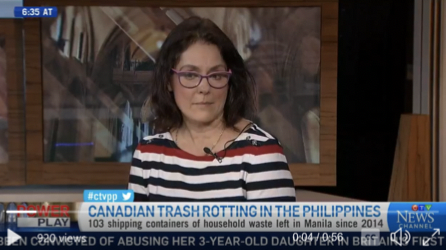 In their appeal to Canadian Prime Minister Justin Trudeau the EcoWaste Coalition requests Canada to take action to resolve a dumping scandal involving the illegal export of wastes from Canada to the Philippines. Ensure the expeditious return to Canada of the wastes illegally exported from Canada and dumped in the Philippines, as is required by the Basel Convention. Ratify the Basel Ban amendment, which would prohibit the export of hazardous waste for any reason from more developed countries to less developed countries. The amendment was put in place by an initiative of the developing and European countries and needs the support of only two more countries to come into effect. Canada is one of only 20 countries that have not supported the amendment.